Back-to-school shopping used to mean a trip to the neighborhood's office supply store to purchase notebooks, pens, pencils, calculators and backpacks. Today, savvy students and teachers rely more on technology than on physical tools to get them through the school year. Education apps have enabled schools to collaborate, helped teachers with their lessons in the classroom, and resulted in students becoming increasingly interested in learning. Apps have also been observed to help students and teachers with organization in and out of the classroom. As more schools incorporate tablets into the classroom, educators are realizing the necessity of apps. We've compiled a list of ten important and inexpensive apps for schools that help administrators, teachers and students excel. Perhaps the most "fun" of the educational iOS apps, EpicWin users customize an avatar, such as a warrior or princess, and complete learning quests in order to score loot. The more quests successfully completed, the higher your level. EpicWin includes time-critical exercises, repetition tasks, reminders for overdue quests and planning for future goals and quest completion. This is an especially great app for students to use as enrichment at home or even as a classroom activity with a substitute teacher. Parents also can use EpicWin to encourage successful completion of otherwise dreaded chores. Group projects used to require careful coordination with students' schedules to ensure successful completion. With Google Drive, students can take digital notes, collaborate with their peers on joint documents, charts and presentations, and interact in real time with their teachers. Teachers also use Google Drive to create lesson plans with fellow faculty members, create paperless classroom handouts, assignments and assessments, and backup files without taking up precious hard drive space. Google Drive is compatible with Microsoft Office products, so all documents and presentations can easily be downloaded in a variety of formats. Grammar Jammers is an iOS app that provides primary, elementary and middle school students with entertaining and catchy songs to teach lessons and encourage studying. To ensure understanding, students complete a short quiz about the material at the end of each song. Made by leading learning company Pearson, Grammar Jammers takes the dread out of otherwise boring language lessons. Old, dusty grammar textbooks are a thing of the past with this creative app. Grammar Jammers teach grammar concepts including parts of speech, sentences, punctuation and capitalization. Price: Primary level is free. $2.99 (about £1.75, AU$3.19) for Elementary and Middle editions. Teachers can create courses and easily manage virtual classrooms with Apple's iTunes U. 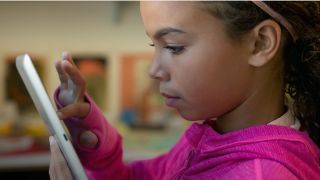 In turn, students receive a customized learning experience from their iPads with easy access to classmates and teachers. The app allows teachers and students to track assignments, organize notes and access materials at any time. By enrolling as an institution, K-12 school districts, colleges and universities can distribute courses and education content by signing up with the public site manager. Designed for students in grades four and up, the NASA App provides access to NASA news, more than 13,000 images, on-demand videos, live streaming of NASA TV, ISS and Earth orbiting trackers, and mission information. This is a great app for students working on school projects and for teachers creating lesson plans about the solar system. The best part? The app is free, which provides schools with quality and engaging teaching material for students without breaking the bank.